Celebrate 5 years with Sky High! Performances, Prizes, Friends, and Fun! It’s hard to believe that 5 years has already come and gone! I am very excited to invite you to our 5-year celebration, showcase, and charity raffle. Sky High Studios officially opened on August 5, 2013. 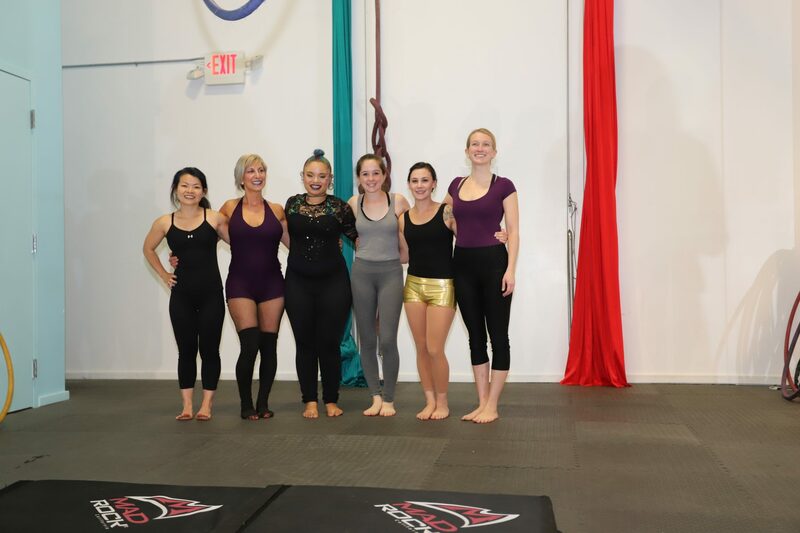 Between then and now so many wonderful people have come through our doors gaining not only physical strength and new skill, but a new sense of confidence, self-discovery, freedom, and community. Having the pleasure of watching the growth of so many people has been one of the most rewarding parts of opening this business. Thank you all to everyone who has been a part of Sky HIgh Studios in the last five years, and here’s to five more! Please read below on how to participate in our celebration as a performer or charity raffle contributor. Get real-time updates on the event by visiting our Facebook event page here. We have had many requests from people who would like to perform in our showcase this year, and we are excited to have as many people as possible perform. Because of the volume of requests, we are asking anyone interested to click on the button below to fill out the performer submission form. This way we can accommodate as many people in the showcase as possible. While we would love to have everyone, the party can only last so long. Thank you so much for wanting to be a part of our celebration! Performances will be announced below, and in our blog post updates and we select participants. The AFSP’s mission is to save lives and bring hope to those affected by suicide. They engage with families, mental health professionals, community and local business leaders, school administrators and others interested in preventing suicide. The AFSP has been a huge part of our celebration for the last 2 years, and in that time we have raised approximately $3000, and last year our donation sent them over the $100,000 mark for the very first time. Suicide, depression, anxiety, and self-harm affect more people than we know, and have personally affected so many people in the studio. Supporting this cause and giving back to our community is a huge part of Sky High Studios. The funds are donated to the AFSP in the name of Chanan Moffit, one of our instructors who participates in the Out of Darkness walk every year to support the Massachusetts Chapter of this amazing organization. If you would like to learn more about AFSP, and contribute a raffle prize to our fundraiser please use the links below. If you cannot make it to the event, and would like to date directly to the AFSP in leiu of raffle tickets, please click the donate button. All donations go under Chanan Moffit, who is participating in the Out of Darkness Walk on the day of the party, and under whom our donations are given. Please help to support her in this amazing cause. Every year we honor those who have struggled with mental illness, and have suffered through anxiety, depression, self-harm, addiction, and suicidal thoughts. Some have survived, and others have not. If you would like to have someone honored at our celebration (whether or not you are present at the event) please write the person’s name on a semicolon sheet and place it in the box. The names submitted to us are hung in the window of our main lobby. A semicolon is used when the author could have ended the sentence, but chose not to. You are the author, and the sentence is your life. Enter the name of someone you would like to us to honor in the box below. If you would like to remain anonymous, then simply write “Anonymous” in the box and we will use that on the card. Check out all the fun we had last year! our new Sky High Studios App on your phone! Please provide a short description of what you would like to contribute to our raffle (i.e. gift certificate, specific service, prize basket, etc. ).